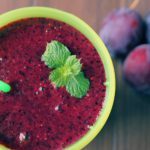 When plums are in season, throw a couple of freshly-pitted ripe ones in the blender, just to savor their purple wonder. A few tablespoons of oats adds body and keeps you full longer than the usual smoothie. Combine all the ingredients in the blender and process. Serve immediately. Add a little extra kick to your smoothie game with HealthForce Superfoods! We love their products and carry a great selection in our Wellness Department!